The Ngorongoro Highlands is a dramatic range of volcanic mountains that straddles the rift valley escarpment immediately to the south of the Serengeti. Also it is probably one of the most beautiful safari areas in East Africa that most people who come is to visit, Away from the crater the highlands are much more remote and contain some superb hiking and trekking. vTo cross these huge landscapes on foot in the company of Maasai ‘morani’ is a real experience.Those who have time can explore the less publicized natural features further afield. These include Olduvai Gorge, Olmoti and Empakaai Craters, the Gol Mountains and Mount Lolmalasin (3rd highest in Tanzania). Lake Ndutu is a very special location to visit around the month of February when the migrating herds of wildebeest congregate in the area for calving season. Today our journey in the morning will take you to the Ngorongoro Crater from Arusha town. You will spend all day in the Ngorongoro Crater floor for game viewing.Ngorongoro Crater is the largest intact caldera, a cooking pot shaped collapsed volcano, in the world, with a crater 259 square kilometers (100 square miles) in area and with walls 600 meters (1970 feet) in height. It is believed that the Ngorongoro Crater volcano was originally taller than, or as high as Mount Kilimanjaro, one of the highest mountains in the world. Ngorongoro Crater is host to approximately 30,000 to 40,000 birds and animals, most notably some stunning pink flamingos and the rare black rhino. In the centre of the Ngorongoro Crater is a salt-water lake by the name of ‘Makat’ or ‘Magadi’, and to the east of the crater is a spring named Ngoitokitok Spring. The Ngorongoro Crater sees approximately 450,000 tourists a year, who are required to be accompanied by a guide and a permit. ‘Ngorongoro Crater’ is also known as the ‘Garden of Eden’, due to the crater’s beauty and it being a paradise for animals. 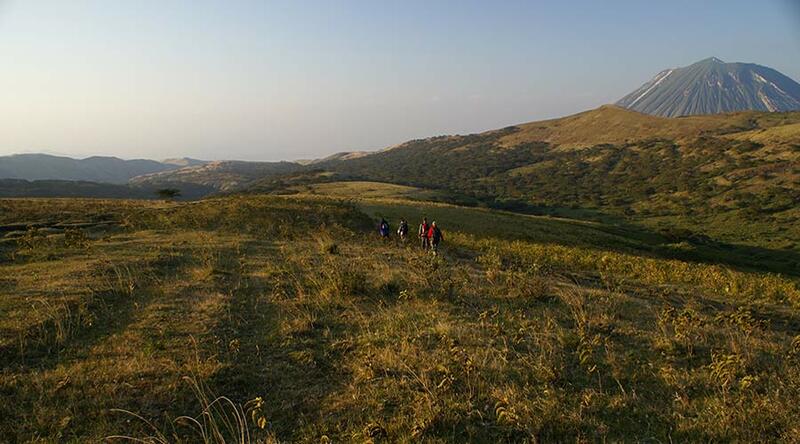 Many significant fossils have been found in the area surrounding the Ngorongoro Crater, some of which can be found in a nearby museum, and burial mounds have been found in the crater itself. Ngorongoro Crater became a UNESCO World Heritage Site in 1979, as part of the Ngorongoro Conservation Area, which also includes two other craters. In the evening before 6:00 pm you will drive out of the Crater, your overnight stay on the Crater rim at Simba A Public Camp site. After breakfast your driver guide will drive you to Nainokanoka Maasai village and meet your Maasai guide on the slopes of Olmoti Crater. The hike proceeds to Empakaii Crater (4-6 hrs). At Empakaii, you will have time to explore the rim of the Crater. Your camping will be on the crater rim to minimize the environmental impacts on the crater floor ecosystem. In the morning today is spent exploring the Empakaii Crater floor with picnic lunch. The lake is a primary breeding ground for flamingos, the forest is full of birds, buffalo and hyena inhabit the plains, and there is a good chance of spotting a leopard in the early morning. In the afternoon you will drive back to Arusha for your dinner and overnight.